I could probably save myself a bunch of typing and just go back to a year ago and copy and paste my posts from last October into this year. Four weeks to race day. One very long run. And I’m broken again. I ran my 14 miles successfully on Saturday. I foam rolled before I left the house that morning. I came home and took an ice bath. I received a professional stretching session. I was up and at ’em for the rest of the day, no problems. Sunday was more of the same. Slightly sore muscles but no issues. Yesterday, I took myself out for a (relatively) easy 7 miler, and by mile 3, I knew I wasn’t going to make it; my left knee was killing me. It’s that familiar anterior pain I know so well. My IT band is jacked up. Last year it was the right knee, this year it is the left. I came home after only 5 of my 7 planned miles. I am frustrated. Why does this happen in the Summer/Autumn training season but not the Winter/Spring? 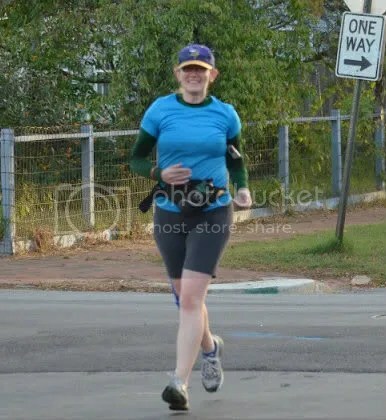 I have run two half marathons in March with no IT issues, and I am getting ready for my second November race, and have my second major IT injury. It can’t just be the long distance runs triggering it because I would have the same problems during my spring training. I know the drill. Back off running. Stretch. Ice. Tape. Compression. Massage. I could pay the $35 a session to go see Dr. Green at Active Chiropractic, but work and finance considerations don’t really allow for that (work more than anything else). This is so familiar that I can set myself my own treatment plan. No running this week; I will consign myself to the stationary bike. I am icing it regularly (like, right now). Foam rolling. Self-massaging the band along my knee. Stretch breaks in the conference room. We are supposed to run 10 miles on Saturday. I was really looking forward to it because first, it’s a drop back week, second, 10 miles is my favorite distance, and third, it will be in the 30s on Saturday morning and I love cold weather running. Now my week will be full of self-doubt and questioning on whether I should go or not go. I *want* to go. I *need* to go. But I also can tell you from experience that it would probably be best if I didn’t go. I wouldn’t say I conquered 12 miles. I conquered 9 miles, and then suffered the worst 5k of my life. My first 9 miles were run pretty much at my goal pace. I was really pleased with that; I felt good, strong, the knee was achy and complaining, but solid. And then the last 3.3 miles (the whole route was about 12.3 miles) took most of an hour. I am not kidding. It was like a switch got thrown right at the 9 mile mark and I went from achy to agonized. The pain in my knee progressed to muscle spasms across my quadriceps and even down my calf and shooting pains and spasms into the arch of my foot. A painful reminder just how much your body is a completely interconnected system. Pain became fear, and by the bitter end, fear threatened to become panic and irrational tears. I got back to the stadium to find it largely emptied out. The intermediate teams had long ago left. It was just the stragglers left. I clocked an average pace of 13:14. Not much I can say about it. I was upset, but I knew going in that 12 miles is a difficult distance for me mentally. Add in the physical difficulty I was facing, and there was no real way for me to come away from the run cheerful and chipper. I saw the chiropractor again yesterday who worked me over. He wants me to completely lay off running unless I want to run the long one on Saturday, but he would prefer I didn’t. Between now and next Saturday, my focus is strictly on cross-training. He prefers using a bike, but he is an avid cyclist (he is flying to Florida today for IronMan Florida this weekend), so that figures. I will probably alternate biking and swimming if I can since I find stationary bikes only slightly more fun than watching paint dry. The goal is to get a moderately difficult Perceived Rate of Exertion going and do that for the length of time my scheduled run would have taken. With only 10 days to go, I am not going to lose any of my physical or aerobic endurance. I have been wrangling with my mental endurance since this crap with my knee started 3 weeks ago. I am going to spend the next 10 days working on my brain as much as I work on rehabbing the knee. Visualization, yoga, stretching, ice, cross-training, and positive thinking are the prescriptions for the next 10 days. I spent around an hour at Active Chiropractic with Dr. Green and his staff this morning. My first visit to a chiropractor. Like many people, I grew up hearing the myths: they aren’t *really* doctors, they are quacks, they have crazy/dangerous ideas about how to get or stay healthy, and so on. Most of those myths had been dispelled by the time I reached adulthood, but I still hadn’t availed myself to a practitioner, partly for a lack of need, and partly because one last myth remained: that no insurance would cover chiropractic care. Now that the last myth has been thoroughly rolled back, I find myself more than happy with the care I received in that brief hour I was in Dr. Green’s office. It helped that I knew what was wrong with me, that I have experience with IT band issues, that I had been trying on my own to recover, and that I had been educating myself on IT band pain treatment options. We didn’t have to waste any time covering basic education on my injury, or of what his method, Active Release Technique (ART) is, and how it works. I had done my homework. After introductions and minor pleasantries, we went straight to work. Mostly, it involved him applying deep pressure to the areas below, above, and all around the lateral collateral ligament (LCL) as I flexed and extended my right knee. The woman who referred me to him told me it was very painful and that she had wanted to punch him from the pain. Dr. Green joked about positioning himself carefully in case I felt the need to kick him. I neither kicked or punched. It hurt but it hurt in the “this will help” feeling, or what he called “therapeutic pain.” I have been dealing with pain that can spike to a 8 or 9 for the last ten days, so this kind of pain was no picnic, but it didn’t warrant punches or kicks. After the ART therapy, he showed me two new IT band stretches. We talked throughout about my running history, his own (he is an Ironman Triathlete and distance runner himself), and races we have done. He thought it was cool that my first half marathon was a trail race. After stretches, he sprayed some BioFreeze on the area and said this would help dry out my skin and make the tape he was going to apply stick even better. He said KT Tape is a little lower quality than what he uses in his office (Kinesio Tex Gold was what he used) but still effective. He made me realize I was seriously over-stretching the KT tape when I applied it, which is why it would peel off so quickly or seem so ineffective. He also explained that the tape was not to support the ligaments below so much as to lift the skin and allow better circulation to the affected area. His applied tape is supposed to last 3-5 days! I am glad I didn’t write my intended scathing review of KT Tape. Now my opinion is reserved for the next time I have to apply it. The final part of the appointment was when he turned me over to Christine and she hooked me up to their Electronic Muscle Stimulus machine, or what they called their stim unit. I figured it was identical to a TENS unit, which I have had used on my back for severe back pain, but he said its frequencies were different and it was more fine-tuned to this kind of injury. I had to do some Google-ing, but I did learn that the major difference is a TENS unit is designed to ease pain through stimulating nerves, while the EMS using brings no pain relief, but speeds healing by increasing circulation and blood flow to the affected area (or that is what I took away from my Google-efforts). While the machine sent a flow of electricity around my knee, they put an ice pack on it, and I enjoyed the sensation of what felt like carbonated water on my knee; a sort of fizzy sensation. It was relaxing and not at all painful, unlike some of my TENS unit experiences. I set up my follow up for next Tuesday, and feel more optimistic than ever that I can not only run the Richmond Half Marathon, but that my goal time is not necessarily an impossibility. I got my bib number and Wave Assignment (I go off at 7:46 a.m.) yesterday, and plan on availing myself to the Richmond Road Runners Pacer for my goal time. I do extremely well when following someone with a solid cadence, so since the service appears to be free, I am going to find my rabbit and chase her or him all the way to the finish line. Now, I leave you with a big grin (this was 2 miles before it REALLY started to hurt last Saturday).